Pinch me moment! I was recently asked to make a cake for the 25th anniversary celebration of Badgley Mischka. It was such an honor and I still can't really believe it! It was presented to the fashion icons by Naomi Campbell during their show this year at fashion week in NYC. Pretty cool, huh!? I couldn't have pulled it off without help. I have to give a shout out to Erica O'Brien Cake Design... Erica is a great friend and helped me pull this off in a very short time frame. 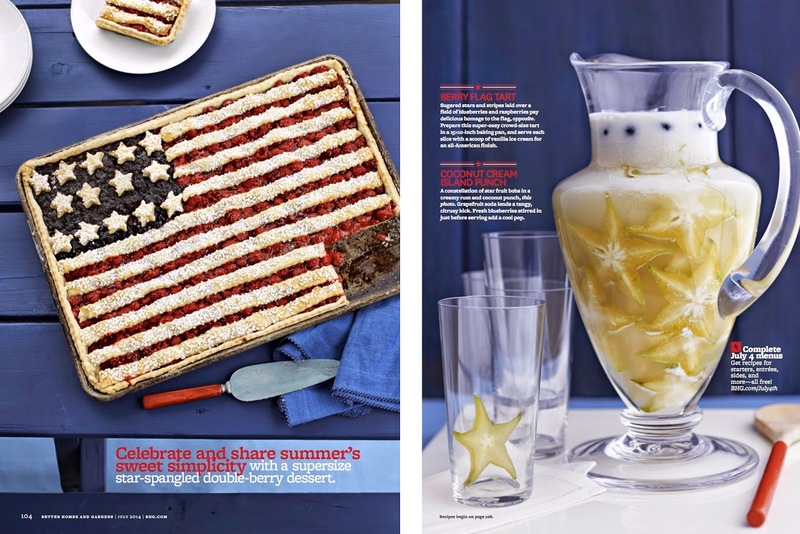 With the 4th of July right around the corner, our friends over at Better Homes and Gardens sent over some delicious sweet treats they are sharing in the July issue. I just can't decide which one I am going to make. Which one looks good to you? 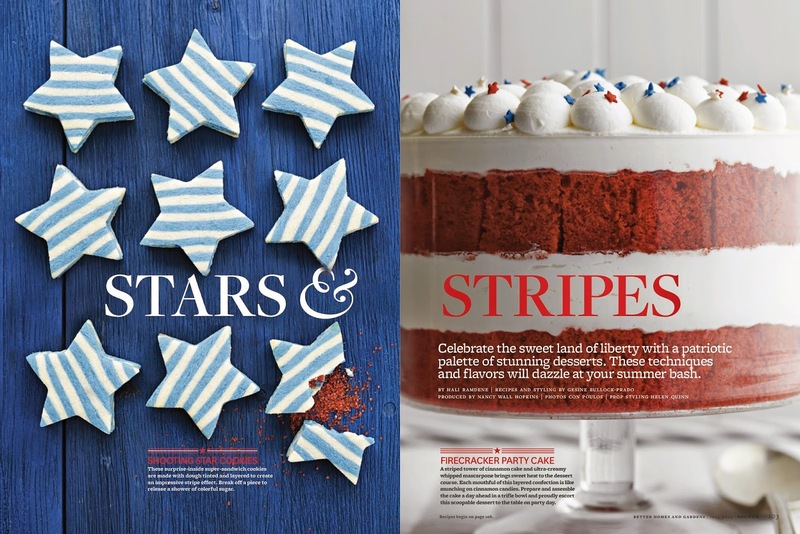 Go pick up your own copy of this month's issue and start cooking! I was recently invited to participate in a friendly design competition for the Happy Family company. 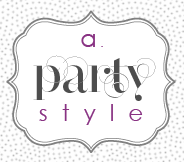 The competition is between myself and three other talented bloggers. 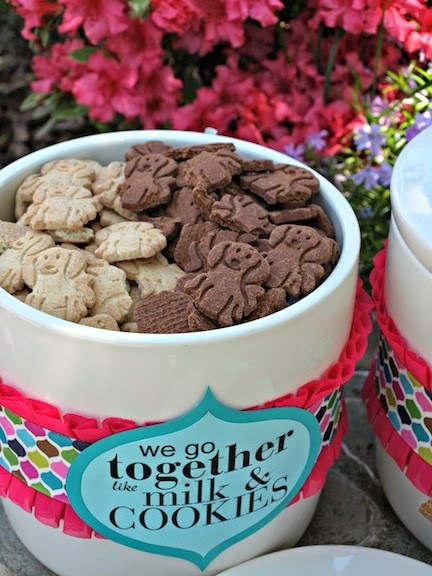 We were asked to design cookie jars for our little ones and one of their friends. 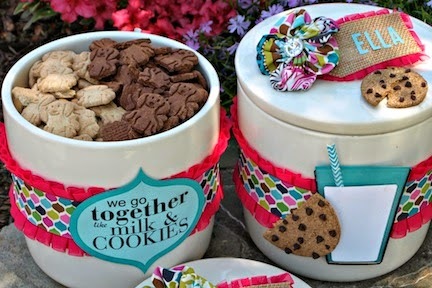 We were all sent a package including two plain cookie jars and a couple of bags of Happy Family's newest product, Happy Tot Best Friends toddler cookies. 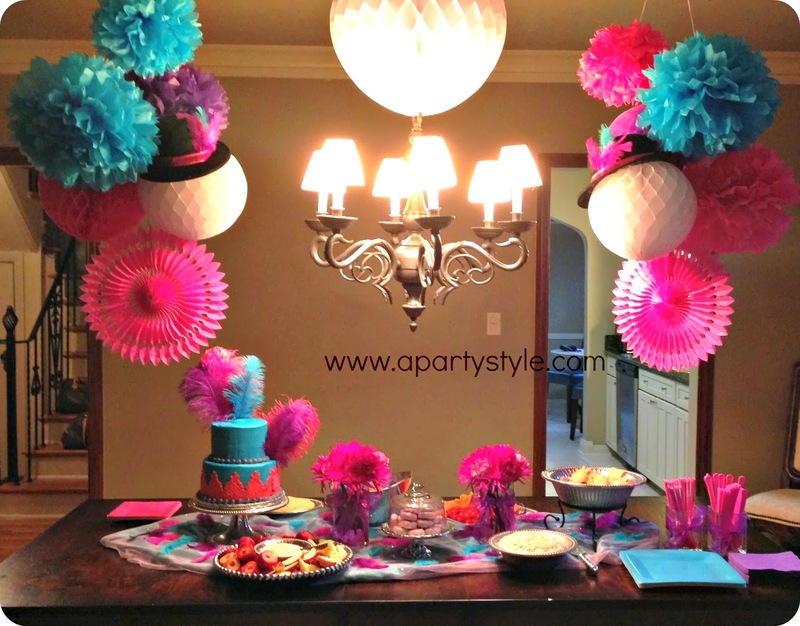 In addition to being allowed to use anything I already owned, I was also given a gift card to shop for additional decor, fabric and/or food to make the display complete. My design process started with a memory. I remember having a best friends necklace when I was a child with one of my neighborhood playmates. The ones where two friends each get a half of a heart necklace bearing the words "Best Friends". 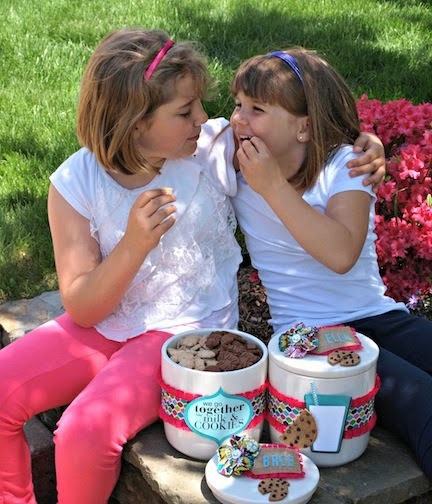 Since this competition related to best friends and cookies, I thought why not use the same idea! I made a faux cookie (out of cork and mini chocolate chips), split it in half and used each half on the cookie jars. And, what pairs well with cookies? Well, milk, of course! So that got me thinking... "we go together like milk and cookies". Perfect! My girls are the best of friends - What makes a better best friend than a sister!? 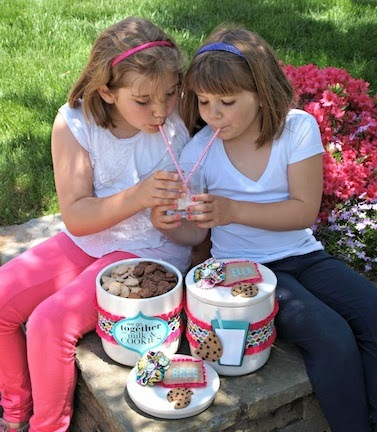 Here are my little ones enjoying their new cookie jars and yummy cookies! And mom loves that the cookies are organic! 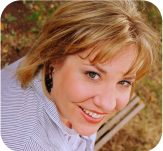 The other bloggers participating need no introduction - they are amazingly talented and I'm honored to be included in such great company - but just in case you don't know one of them, here is the list. Okay, so go vote for your favorite design! FTC disclaimer: I was not paid to participate, but did receive product on behalf of Happy Family. 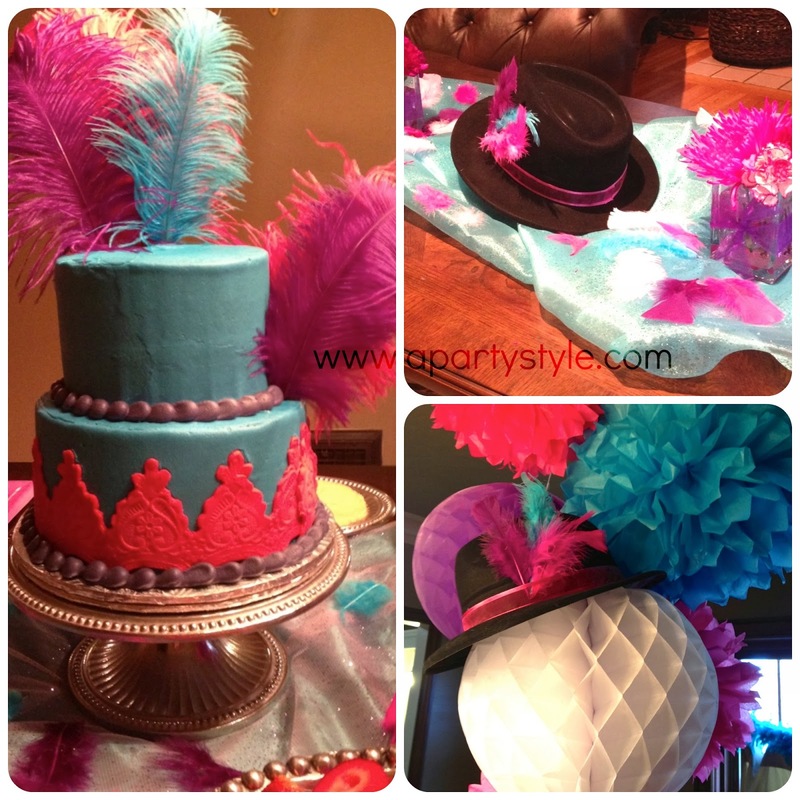 My sister-in-law recently hosted a couples wedding shower with a perfect theme to encompass men and women - feathers and fedoras! Here are a few quick pictures from the day.